I’ve completed 18 of the 35 teeth of the first edging of this shawl. Just over the halfway mark! The shawl is the Square Medallion Shawl from The Gossamer Webs Design Collection: Three Orenburg Shawls to Knit . The yarn is a very fine unbleached linen. It’s on a cone with no label, so I suspect that I picked it up in a weaving supply shop at some point, perhaps on one of my first visits to London. 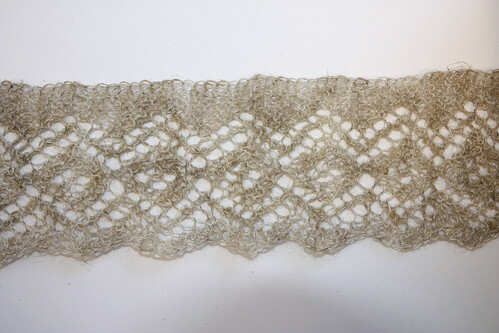 This entry was posted on May 9, 2010 at 2:28 pm	and is filed under Crafts, knitting. Tagged: knitting, orenburg shawl. You can follow any responses to this entry through the RSS 2.0 feed. You can leave a response, or trackback from your own site. Gorgeous needlework, but it’s hard to tell dimensions from the picture. What are the final measurements going to be? Hard to say because it depends on how much it stretches when blocked. The edging is about 3″ wide. My guess is that the finished square will be about 50 inches. This is lovely! It looks so delicate and gossamer-like!